Was fabulous to have a mid-week public holiday yesterday and I tried to find the perfect balance between keeping myself busy and finding a little time to relax. I think I did a spot-on job. On Tuesday night Varen & I had dinner. Perhaps not the smartest idea I hear you say ... but we wanted to see each other. I guess we're not very good at this broken up thing. At the very least we seem to have removed the obligatory bits of our relationship and are just trying keep the good bits. We are essentially really good friends. So we went to Allora in Befordview. Not my favourite restaurant, but he likes it and during our past visits, I've managed to find the one item on their menu I love, some sort of Melanzane Pasta. So, to start the evening off exceptionally well, I discovered they've now changed their menu and removed this dish. Hello? Which left me to struggle thru the menu and try to find something else to tide me over for the evening. But without the Melanzane on offer, I won't be rushing back to them. The company was good although there were a few tears here and there (me). I think it's a sort of weird space for us (obviously) and we just have to figure out the rules, what's allowed and what's best left behind. So just one more complication to my already complicated life. After dinner, we went back to his place and tried to watch Prison Break. I say tried, because I fell asleep half-way thru. It was a nice evening, but things are still a little odd. He seems to have told everyone we broke up and is now struggling to explain why we have seen each other. I've hardly told anyone - except all of you, which is hardly anyone at all ;) I think he was hoping his parents wouldn't notice my car at his house ... he didn't even tell them he was going for dinner with me. And then as much as he apparently wanted me along on the bike-ride the next day, the raised eyebrows from his friends would've been too much for him. I guess I can understand it ... but I'd prefer his reasons to be less about what people think and more about us defining our own space and doing our own thing, you know? And yes, I know he'll be reading this. I wonder if it will trigger further debate on our relationship boundaries? So yesterday I spent my morning relaxing and catching up on the last half hour of Prison Break with Loulou. Then we decided to catch an early movie together :) And aside from the hordes of pre-teens out and about strutting their stuff (there is no way we could ever have been that annoying in our time, surely? ), it was a good way to spend the afternoon. Anyway, we saw Marie Antoinette. The Party That Started A Revolution. 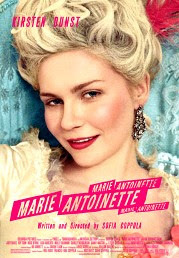 Often maligned, passionately debated and ultimately a misunderstood young woman, Marie Antoinette (Kirsten Dunst), through Coppola's vision, emerges neither as staid historical villain nor divine idol – but as a confused and lonely teenage outsider thrust against her will into a decadent and scandal-plagued world on the eve of disaster. Oscar winner Sofia Coppola brings to the screen a fresh interpretation of the life of France's legendary teenage queen Marie Antoinette. Betrothed to King Louis XVI (Jason Schwartzman), the naïve Marie Antoinette (Kirsten Dunst) at the age of 14, she is thrown into the opulent French court which is steeped in conspiracy and scandal. Alone, without guidance, and adrift in a dangerous world, the young Marie Antoinette rebels against the isolated atmosphere at Versailles and, in the process, becomes France's most misunderstood monarch. I liked it, I thought it was fun. Besides, I like Kirsten Dunst, when she's not MJ in Spiderman. 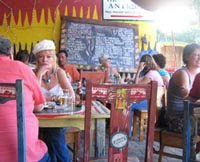 And then it was off to dinner with JofH in Greenside at Mama Themba's (again with the no web-presence). It's a fairly new African-style restaurant. The food is not all that, but the vibe and funk of the place are just the sort I love :) And we managed to avoid the whole job-offer discussion. I guess that'll happen sometime today. Other than that, it was fab to see him again and there was much hysterical laughter!